The Travelers: Kids from the Tongabezi Trust School who showed a great interest in wildlife and art. The Excursion: On this daytrip, the kids went on an up-close wildlife adventure to Thorn Tree Lodge in Livingstone, Zambia. This lodge is well-known for its reserve of elephants that mingle and munch surprisingly near to the guests of the lodge! 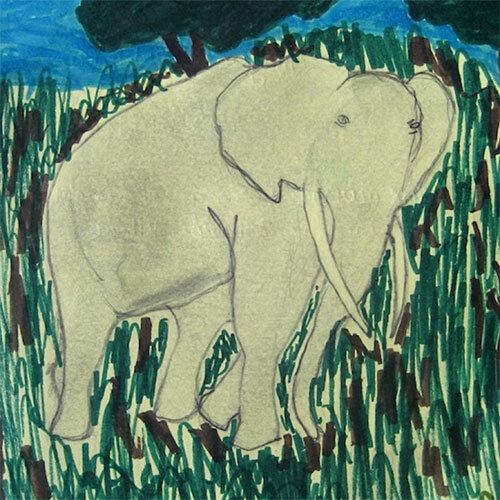 The kids unleashed their imaginations and their artistic flair as they set out to capture the elephants in drawings. At one point, the elephants were even close enough to touch! On a wildlife encounter like this one, the children got a taste of the safari and wildlife tourism that draws so many people to their home country each year. Getting close enough to elephants to feel their leathery skin. Learning about elephant behavior and how to stay safe when they are nearby. Enjoying a fun, inspiring space at a lodge that caters to mainly to foreigners. The Tongabezi Trust School was set up by Vanessa Parker, who was previously teaching as a volunteer in Livingstone. The school opened on 1 May 1996 and due to its huge success it has been growing ever since. The school provides education to the Tongabezi staff children, as well as children from the local community, in an area where educational funding and materials are scarce. Over the years, it has grown from a pre-school class of 15 children, to a primary school with over 240 students.